There are women who work out, and then there are moms who work out. They're not the same thing. Throw kids into the equation, and finding the time and energy to sweat becomes exponentially more difficult. 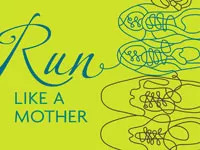 No one knows that better than runner moms Dimity McDowell and Sarah Bowen Shea, as witnessed by their terrific new book, Run Like a Mother. This is an excellent go-to guide for any mom who wants to become a runnerâor already is, but could use some girlfriend-style advice on how to do it better. Dimity and Sarah (both of whom have written for Health magazine) have been there, in the trenches. They know what it's like to really want to choose extra shut-eye over a morning run. To fall prey to the tug-of-war between having no time to run and needing to run to stay sane. To feel that exquisite blend of agony and elation when you finally drag yourself over the finish line of your first (or third or tenth) race. Filled with humorous personal essays, fresh tips on everything from choosing shoes to training, engaging playlists for your iPod, and laugh-out-loud anecdotes from other mom runners, this book is that rare combination of a really fun read that actually delivers loads of useful info. On motivation: "Pay yourself a quarter for every mile; after 10 runs, make a matinee date with a girlfriend; promise to make cupcakes with your kiddos after your 7-miler on Saturday." On mental toughness: "I picture a place toward the end of my run...like the Vera Katz statue and I imagine myself being there." On what to wear: "Fall through spring, dress like it's 10 degrees warmer outside than it really is. You'll be chilly initially but will quickly heat up." On pre-race beauty tips: "Don't wax or pluck your brows too drastically. It isn't until sweat is streaming unimpeded from your forehead into your eyes that you realize why we have bushy eyebrows." On getting back into the groove post-baby: "Run when a part of you feels twitchy enough to try it and stop when it feels like too much." Want more? You'll just have to get your own copy.